Magical Monday…let’s make some ACTION! 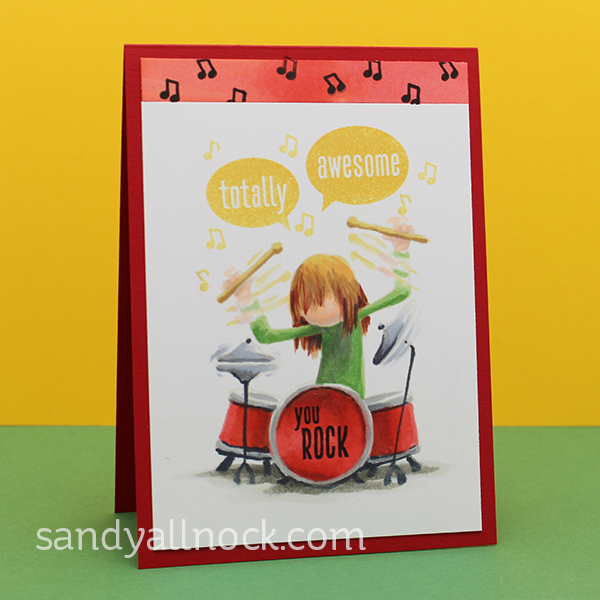 I saw this Stoked stamp set from Avery Elle – and the boys in the stamps were just ROCKING OUT! Whether flying through the air or banging madly on drums, these stamps don’t sit still. Our coloring shouldn’t either! Watch the video below or click HERE to see it in HD on YouTube. I trimmed out my image uhhhh well…not correctly. Not sure what I was thinking, but I needed to extend the image so made my own “paper” by coloring a strip in red, then stamping the music notes from the stamp set onto it. I love your drummer rockin’ out! This card is rockin! 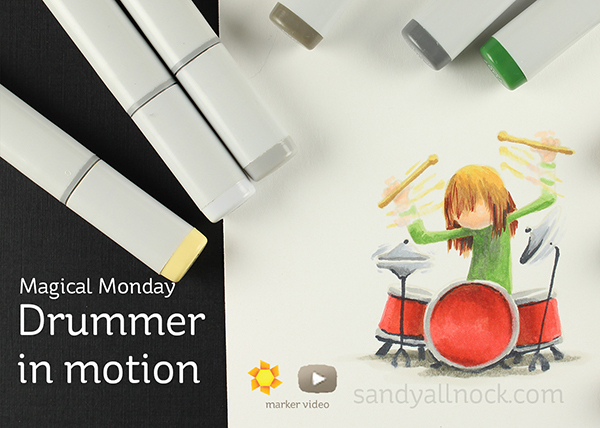 Love that motion…rock on! Oh my goodness! This really caught my eye…I am totally a florals kinda girl, HOWEVER, I have 3 daughters and my 2 oldest (my youngest is only 9 but is on her way to becoming a percussionist as well) are percussionists and if this was colored w/ dk brown hair, it would totally look like my oldest and if you used your mad coloring skills and made this w/ longer dk. brown hair, it would totally be my middle! Thank you so much for sharing! so VERY cool Sandy! TFS your rockin’ vid with us! As the sentiment says, “Totally Awesome!” Thanks Sandy for a fun start to a Monday! What a fun and uplifting video. Dudette – you are smokin!! !